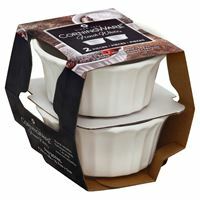 (2) 22oz Mugs, (2) 16oz Round Dishes, Vented Plastic Covers. Use in oven, microwave, refrigerator, and freezer. 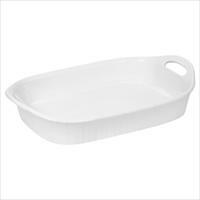 Corningware material resists chipping and cracking. Dishwasher safe, durable non-porous surface. 1.5Qt & 2.5Qt round, glass and plastic lids; 16oz round. Use in oven, microwave, refrigerator, and freezer . 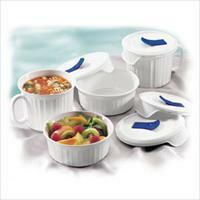 CorningWare material resists chipping and cracking. 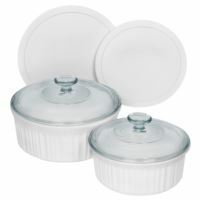 Glass & plastic lids simplify cooking, serving, and storage. Dishwasher safe, durable non-porous glass. 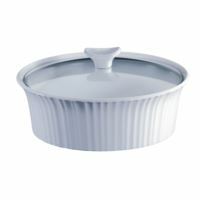 2.5Qt round, glass lid; 1.5Qt & 16oz round, plastic lids. Use in oven, microwave, refrigerator, and freezer. 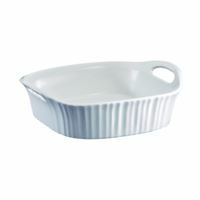 Corningware material resists chipping and cracking. 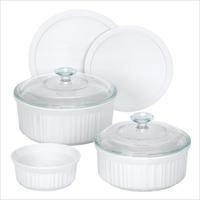 Glass & plastic lids simplify cooking, serving, and storage. Dishwasher safe, durable non-porous surface. 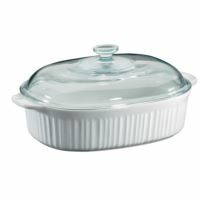 French White® 2.5-qt Round Casserole w/ Glass Lid. 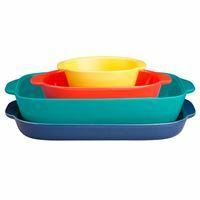 Bakeware is made of a durable stoneware material. 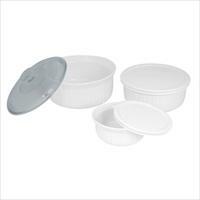 Dishwasher, refrigerator, freezer & microwave safe. Oven safe (preheated oven). 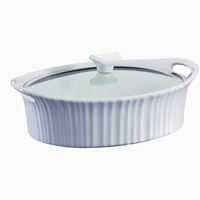 Bakeware resists chipping & cracking. Non-porous surface does not absorb food odors, flavors or stains. 1 Year Limited Warranty. 1.9 Qt Twilight Baker, 3 Qt Pool Baker, 1.5 Qt Vermilion Baker, 2O oz Curry Baker. Durable stoneware. Each piece stacks inside the other for compact storage. Oven, microwave & dishwasher safe. 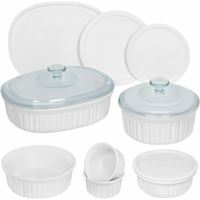 Includes 1-Qt (8" x 5-1/2 x 1-1/2") and 2-Qt (11" x 7-3/4" x 1-3/4) baking dishes. Stoneware is safe to use in microwave, oven, refrigerator, freezer & dishwasher. Resists chipping and cracking. Non-porous surface does not absorb food odors, flavors or stains. Set includes: (1ea) 2.5 quart and 1.5 quart round with glass & plastic covers. Bakeware is made of a durable stoneware material. Dishwasher, refrigerator, freezer & microwave safe. Oven safe (preheated oven). 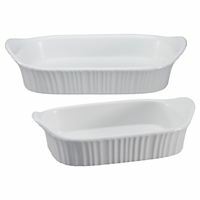 Bakeware resists chipping & cracking. Non-porous surface does not absorb food odors, flavors or stains. 1 Year Limited Warranty. 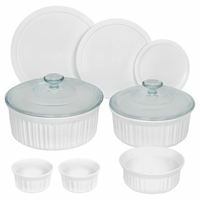 2.5 Qt Oval dish and 1.5 Qt Round dish with glass and plastic covers,16 oz round dish with plastic cover, (2) 4 oz ramekins, 24 oz round dish with plastic cover. Stoneware is safe to use in microwave, oven, refrigerator, freezer & dishwasher. Resists chipping and cracking. Non-porous surface does not absorb food odors, flavors or stains. (2) 7 oz round Ramekins. Stoneware is safe to use in microwave, oven, refrigerator, freezer & dishwasher. Resists chipping and cracking. Non-porous surface does not absorb food odors, flavors or stains.